We are pleased to announce Year 3 of the “Implementation Science to Improve Patient Care” program, a collaboration between the USC and UCLA CTSIs and Los Angeles County DHS. 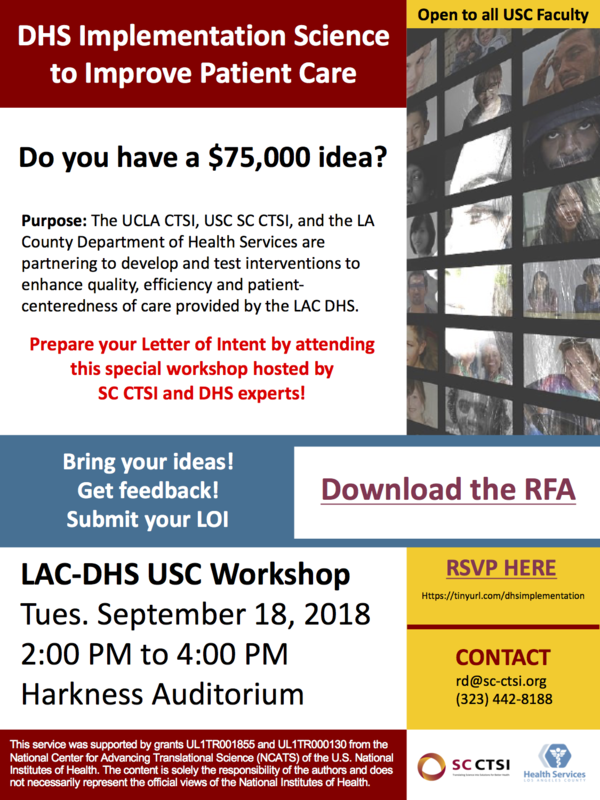 The UCLA CTSI, USC SC CTSI, and the LA County Department of Health Services are partnering to develop and test interventions to enhance quality, efficiency and patient-centeredness of care provided by the LAC DHS. Prepare your Letter of Intent by attending this special workshop hosted by SC CTSI and DHS experts! Bring your ideas! Get feedback! Submit your LOI! Click here to access the meeting online. Click here to download the RFA. Please visit the DHS Call for Applications website here.